Ireland, A Nation (1914) | Come Here To Me! At the moment, I’m reading and enjoying Arthur Flynn’s book The Story of Irish Cinema. One film which grabbed my attention was Ireland, A Nation, a 1914 production which originated in the United States and dealt primarily with Irish history between the rebellion of the United Irishmen in 1798 and Emmet’s Rebellion in 1803. While the film contained many inaccuracies, it still enjoyed some success. It is noted in the excellent Cinema and Ireland that the film “had a remarkable run in Chicago, where it was shown for 20 consecutive weeks to huge crowds.” The film was heavily censored in Ireland, and the first print of the film bound for Ireland sunk with the Lusitania in 1915. 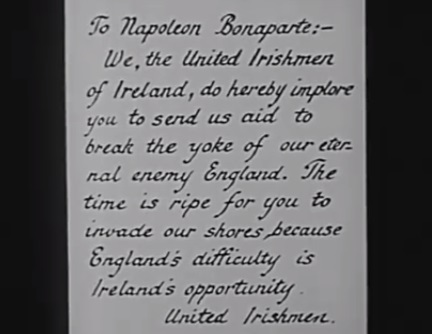 A scene from the film, showing a letter handed by Robert Emmet to Napoleon. Today, we can watch 43 minutes of Ireland, A Nation thanks to the excellent work of the Trinity College Dublin Irish Film and TV Research Online team. The film was later amended to include newsreel footage from the Irish revolutionary period of the early twentieth century. on August 15, 2015 at 2:59 pm | Reply ‘Ireland at the Movies’ exhibition | Come here to me!